The “weeping palm” icon was hand-copied very much like the helmet motif on Herod The Great’s 8-Prutot Piece (scroll down to the animated gif), only from a poor example. 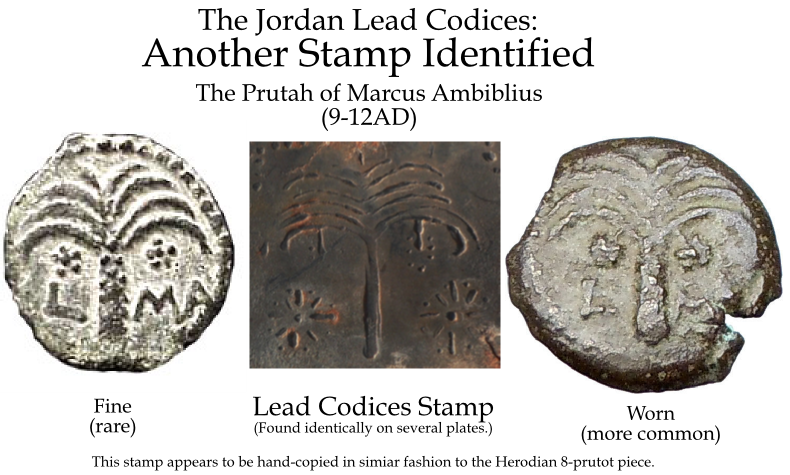 This motif is only found in one other piece in antiquity, and that is on the coins of Coponius, who was Ambiblius’ predecessor (6-9 AD) with slight variation. I was able to find a good example of a worn specimen that illustrates exactly how similar these illustrations are. Taking everything into account (as this motif is found on plates that contain repeated, stamped text as well), this yet another strong evidence of forgery/fakery as the iconography on the Codices continues to betray itself as a pastiche of disparate eras, crudely copied en-masse.